The King of the Cage promotion delivered yet another exciting fight car for the fight fan’s enjoyment. This time, the popular MMA promotion took their show to the deep South of New Mexico as they invaded the Las Cruces Convention Center for their “Throwdown” event. The event had a solid turnout from the Las Cruces fight fans as they had a full house in the Convention Center with a loud, supportive audience. The fight card featured one professional bout, one top contender amateur bout, and several very intriguing match-ups. The fight card boasted two judge’s decisions, seven (t)ko’s, and five submissions. In the main event, Parabellum MMA’s Brian Castillo took on Judgement MMA’s John Rozema in t lone professional bout on the fight card. In what was billed as a match-up to deliver fireworks, the duo gave the fight fans exactly that, a fight filled with exciting moments. “Rocek’em Sock’em” John Rozema pressured early as his reputation as an aggressive striker would suggest and Castillo would look to counter the powerful striking with his own powerful grappling. Rozema would defend the takedown initially but Castillo grinded the attempt out until he was able to ground Rozema to the mat. While Rozema was smothered beneath Castillo, he was able to land to the body with short punches and elbows, Castillo however, absorbed the strikes and took the back of Rozema but could not capitalize to get a finish. Rozema would get to his feet at the end of the round unleashing a barrage of elbows and punches that visibly stunned Castillo. It was a close round between a grappling minded fighter versus a striking minded fighter. If a winner had to be decided, the top control and positional success may have swayed a Castillo 10-9 round. The second round began with a Castillo takedown and Rozema throwing more strikes to the body to force Castillo’s top pressure to allow some space. When Rozema found that space, he attempted to rise to his feet and on the way up, Castillo delivered a huge knee that dazed Rozema. Castillo would follow-up with three more and the referee would step in to halt any more damage to the stunned Rozema. The fight ending sequence was marred by controversy as the Rozema corner was very upset that the knees to Rozema were illegal. The corner’s protest was that Rozema had “3 points of contact” down on the mat meaning that three of four limbs were on the mat which would make knees and kicks illegal from Castillo. The knees resulted in a very bad cut on the face of Rozema and the team from Judgement MMA will now look to pursue an overturning of the decision from the Athletic Commission on the grounds that the knees that forced the TKO were illegal. The co-main event of the evening delivered in back-and-forth action as El Paso’s Cristobal Chavez Davila and Colorado’s Kevin Wirth engaged in a methodical battle of crisp technique, quick scrambles and all-around MMA talent. The fight started with inside leg kicks from Cristobal, which would be a regular theme while the fight stayed standing. The fight would hit the mat after a scramble and a grappling chess match would ensue. The grappling was back-and-forth, both fighters fought for position, countered, and worked to one-up the other to get to a dominant position. 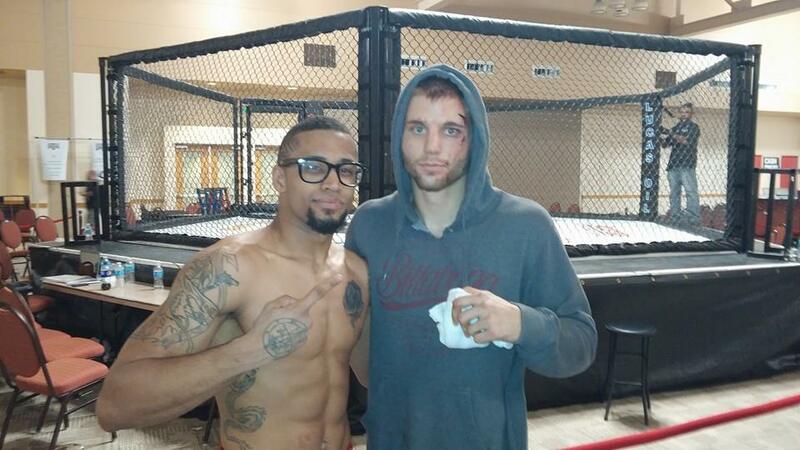 While the two threw their best at one another in caged combat, Brian Castillo (left) and John Rozema (right) show mutual respect after their main event bout. In the second frame, Cristobal seemed to find his range on the feet but was caught with the round’s most significant strike as Wirth landed a counter right hand that seemed to stun his opponent. The fight would once again hit the mat where the two dynamic grapplers would continue their chess match of methodical grappling where it seemed as if neither could get the upper hand for long enough to capitalize. Cristobal stunned Wirth in the third round and would find success in arguably the fight’s best moment when he worked the “De La Riva” guard; a position and guard that typically is solely used in Gi Jiu Jitsu. From the guard, Cristobal was able to transition into a toe hold that he came very close to finishing. Wirth’s toughness would show up once again, as it has in so many of his fights and he was able to hold on for the end of the third round. The fight was extremely close and competitively entertaining. Two judge’s scored it in favor of Cristobal and one Judge scored it for Wirth, which left Cristobal with the Split Decision victory. The future for Cristobal’s title ambitions is unknown without knowing the timetable for Champion Robert Herrera’s return to the cage, but there is no argument that Cristobal is now the 135-pound amateur title top contender and at 5-0 is one of New Mexico’s hottest prospects in the amateur ranks. The Get Fit Fight Gym from El Paso came to fight on Saturday night. They were the most represented gym on the fight card with seven fighters and with a 4-3 finishing record at “Throwdown”, they really made a statement as to why they should always be a team to be respected when their fighters step into the cage. In the four victories from Get Fit Fight competitors, only one needed to see a second round and the quickest of which came by way of TKO when Nathan Vidana took out Adam Juarez of Las Cruces in 73-seconds. Amongst the most impressive performances on the undercard, Get Fit Fight’s Fred Rodriguez was able to earn a solid victory over former collegiate wrestler Frisco Deleon in a Heavyweight match-up. Despite losing the first round convincingly, he was able to mount a comeback to pick up the victory. Deleon was able to secure a takedown in the first round and implored a ground and pound heavy attack that nearly finished Rodriguez. While moving dominantly from mount to side control and back to mount, Deleon even snatched up a keylock on two occasions, both of which were incredibly deep. Despite it looking as if Rodriguez would have his arm ripped off his shoulder, he fought resiliently and escaped the round. In the second, Rodriguez stuffed the takedowns of Deleon and used a crisp combination of punches to drop his opponent and earn the come-from-behind TKO victory. It was an exciting moment that had a sway of emotion stemming from the huge first round of Deleon and the heart to come back strong in the second round for Rodriguez. Another stand-out performer from “Throwdown” was Victor Orquiz from the Dona Ana Boxing Club. In just 76-seconds, Orquiz showed those in attendance his excellent striking skills as he came to “throwdown” against opponent Jesus Alaniz. Orquiz kept a safe distance while unleashing his own relaxed, pinpoint accurate strikes to batter his opponent. It seemed as if Orquiz was locked in and in the zone Saturday night as he had his hands dropped seemingly from the opening bell to the TKO finish, a dominant showing from the Las Cruces fighter. The night proved to be yet another solid and exciting fight card for the King of the Cage promotion. It has run a six event streak of immensely exciting fight cards. In a bit of news, the promotion will look to build on that streak with a May 24th event in Albuquerque and an event on July 26th once again in Las Cruces. The fight card for the Albuquerque event will be released this week, stay tuned to SWFight for that and July 26th will mark the return of Steven Ortega for Las Cruces. Ortega has not fought in Las Cruces for three years now and that announcement is only complimented by the first bout announcement of Alan Lerma versus Tim Sosa in a re-match of their Rocktagon fight back in January. That fight ended in controversy as it was apparent to most that Sosa won the fight but the judge’s awarded Lerma the decision victory. The two will meet once again to settle the score inside the KOTC cage.